Due to lengthy wait lists applications are ONLY being accepted in the following counties: Clarke, Gwinnett, Forsyth, Jones, Peach, and Tift. Dorothy, age 52, has kidney failure and daily home dialysis treatments. With only a few remaining teeth, her diet was limited to boiled foods. 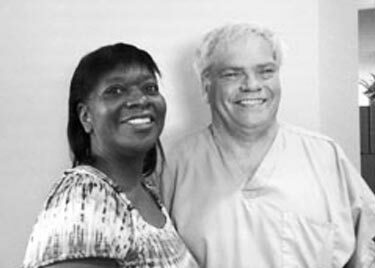 Michael Shields, DMD, donated full upper and partial lower dentures, changing Dorothy’s life and giving her a beautiful new smile.